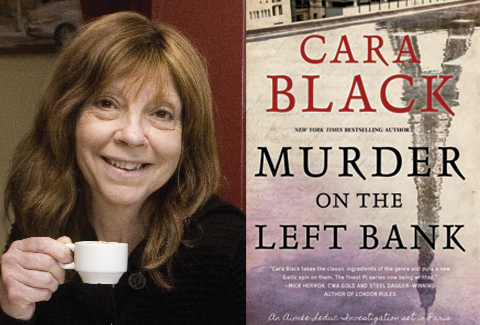 Cara Black needs no introduction. One of Soho Crime’s most prolific, entertaining, and successful authors, her Aimée Leduc Investigations series is beloved by fans across the globe for its resonating descriptions of Paris, dashing, thrilling plots, and, of course, its wonderful heroine, Aimée Leduc, who has kept the motor running for eighteen books. 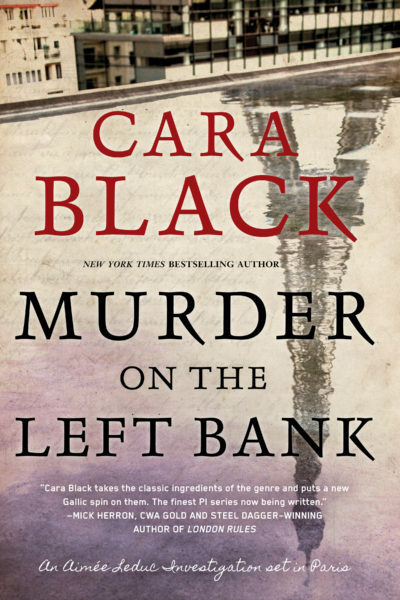 In Murder on the Left Bank, a confession fifty years in the making puts Aimée, everyone’s favorite Paris détéctive très chic, on a collision course with the “Hand”, a cabal of corrupt Parisian cops among whose ranks her disgraced father may have once found membership. When a friend’s child is kidnapped while wearing her daughter’s hoodie, Aimée realizes that the case has crossed into the realm of the personal in more ways than one. In advance of the book’s release, we asked Cara to share with readers some inside information about what drew her to the thirteenth arrondissement, where the book takes place, as well as the research and influences that went into her writing. The thirteenth arrondissement is quite large and made up of old villages that were once not part of Paris proper. For the book, I wanted to incorporate the modern flavors, the ambiance of these distinct parts, and the traces that remain of their pre-Paris histories. There’s le petit Asie, the Asian area, as well as a whole self-contained village, the Butte aux Cailles quartier. The ancient Gobelin tapestry factory is still home to life-long artisans working in the same traditional dyeing and weaving methods that have been used there for centuries. The local pool has thermal springs, and the thirteenth is very much a cultural center for street art. I had to take some flics (police) out to lunch. I got to tour the Gobelins tapestry factory and drink apéros with the tapestry weavers. I chatted up a watch repairer and questioned the vegetable seller at the market. There were also POW camps to tour and WW2 archives to peruse. You know, the usual research. Which books or authors influenced you while writing this book? Years ago, I read Léo Malet’s detective novel, Fog over the Tolbiac Bridge. His detective, Nestor Burma, investigates a crime in the thirteenth arrondissement. Malet set his books in different arrondissements, and shamefully I stole his idea using my detective, Aimée Leduc, in an updated way. Unlike Nestor Burma, however, she’s au courant, fashionable, and is computer savvy. But like him, she’s got a wry sense of humor. The artist Jacques Tardi created his graphic novel, Band Desinée, in conjunction with Fog over the Tolbiac Bridge. I loved it. His graphics combined with Malet’s words captured Paris in the 1950s in a way that let me see and feel the story as I hadn’t before. It inspired me to include the tunnel in rue Watt, a notorious dumping ground that crime gangs used back then and still do today. Yes. I wrote about two brothers of Armenian origin that ran a great resto near the Place Jeanne d’Arc. They grew up in the thirteenth, and remember it as was before the factories were torn down, how the wine depot at Bercy used to function when their parents ran the resto in its former location. They had so many tales to share – it was like taking a journey to old Paris. I wish I could have used more of their stories. Maybe in another book. That they’ve travelled to Paris – without the airfare.